At Planet Apparel, we strive to be the best! Our goal is to make you, the customer, stand above the rest. We pride ourselves in high quality workmanship. If there is ever a question with your order, do not hesitate to call and let us know. We want to excel in customer satisfaction, so, in the unusual event of any discrepancies, please inform us immediately. When you place an order with Planet Apparel, we will email your artwork to be approved by you, the buyer, before imprinting or embroidering your goods. We can also overnight a sample, prior to the production run, at your request for a small fee. There is a common industry standard of a 2% +/- overrun/defect rate. On the average, we maintain less than 1%. We will replace any items that are defective in workmanship or credit your final invoice. Again, we strive for the very best for our customers and for ourselves. We guarantee our products for 90 days. 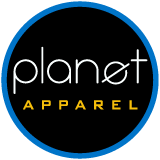 In the event that the products you have purchased from Planet Apparel are not to your standards, we will replace or refund your money at our discretion. Please inform us within 5 days of receipt of your order of any imperfections. For more information about what Planet Apparel can do for you, contact us today. Click here to see what people have to say about Planet Apparel!